New Delhi: Tiger-range governments agreed on the urgent need to address critical management gaps across the tiger’s range at the 3rd Stocktaking Conference on the Global Tiger Recovery Programme. The conference is the latest collective step in the process that began at the 2010 St Petersburg Tiger Summit - where 13 tiger-range governments committed to Tx2 - an ambitious goal to double the global wild tiger population by 2022. “We must take concerted action to revive tiger populations globally, and this can only happen with long-term investment and the utmost commitment of government leaders, especially from Southeast Asia where there is a risk of losing wild tigers altogether,” said Mr. Rajesh Gopal, Secretary General, Global Tiger Forum. Over one-third of tiger conservation sites in the world are severely at risk of losing their wild tigers - the majority of which are in Southeast Asia. Many of these areas lack basic plans for effective management, with over 60 per cent of the sites facing several limitations in anti-poaching, according to a first-ever global survey of tiger sites. Governments reported on the current status of national tiger recovery efforts, highlighting challenges and sharing best practices. Increasing challenges with poaching, lack of capacity, and habitat loss were highlighted as key barriers to tiger recovery among Southeast Asian governments. "The governments in Southeast Asia now face an urgent need to step up their commitment to protect their remaining wild tiger populations. Countries like India, Nepal and Russia have shown that tiger recovery is possible, despite challenges in poaching, funding and sustaining community livelihoods, which can be overcome with strong political commitment,” said Joseph Vattakaven, who participated in the stocktaking conference as WWF’s global lead on tiger recovery. While Thailand continues to report relatively stable tiger numbers, Malaysia and Myanmar included latest population estimates that provide important information to help guide national tiger conservation efforts. “Myanmar is happy to confirm that recent surveys show at least 22 tigers and evidence of breeding from three sites that have been surveyed so far, which gives us hope for higher numbers across the country, and also for the future recovery of our wild tiger population,” said Dr. Tin Zar Kywe, Assistant Director of Myanmar Nature and Wildlife Conservation Division. IUCN’s most recent assessment in 2014 stated that Myanmar had no known breeding population. 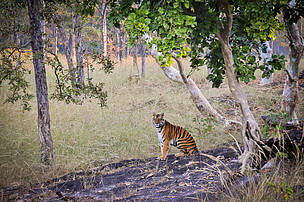 The three areas surveyed equate to less than 10% of potential tiger territory in Myanmar. Malaysia, on the other hand, reported a significant drop from earlier national estimates of around 250 – 340. “Updates presented by the Department of Wildlife and National Parks suggest that Malaysia’s national estimate could be less than 200 individual wild tigers, although the national tiger survey is still ongoing and requires further analysis. However, this reconfirms the urgent need for strong action and sustained investments, “ said Dr Mark Rayan Darmaraj, WWF-Malaysia’s tiger landscape lead. Based on updates by the Department of Wildlife and National Parks, Malaysia also expressed interest in potentially hosting the next Ministerial-level global tiger meeting to help bring attention to tiger conservation efforts in Southeast Asia. The meeting also recognized the Ramnagar Forest Division as a site that has achieved CA|TS accreditation. Conservation Assured Tiger Standards (CA|TS) is a standard used to ensure best management practices in tiger conservation sites. “India’s political leadership on wildlife, its institutional approach and support from many sections of the country has bolstered tiger populations in India. Several challenges remain, developmental and ecological connectivity amongst them. Commitment and inputs at all levels, from governments to individuals, as well as a positive mindset, need to be continued.” said Mr. Ravi Singh, Secretary General & CEO, WWF-India. The 3rd Stocktaking Conference took place on 28 – 29 January and is organized by Global Tiger Forum, held in collaboration with Global Tiger Initiative Council (GTIC), National Tiger Conservation Authority (Government of India), Wildlife Conservation Trust (WCT), Wildlife Trust of India (WTI), and WWF. The Global Tiger Forum (GTF) is the only inter-governmental international body of Tiger Range Countries to embark on a global campaign to protect the Tiger. It is also the implementing arm for tiger agenda in the re-structured Global Tiger Initiative Council (erstwhile, GTI program of the World Bank). The GTF is working across several tiger landscapes through its ongoing initiatives.